On the corner of Bowery and Broome, owners Kevin King and Cordell Lochin have opened Esther & Carol, a bistro that serves dishes like a Caesar salad with crispy artichokes and grilled pork chops. The restaurant's name pays homage to their mothers. There's also a recording studio downstairs. Esther & Carol, 341 Broome St., New York, NY 10013, 646-355-1840. The sprawling arched city landmark on the boardwalk in Coney Island is home to Kitchen 21. It includes takeout from Coney Island Café, seafood and beer from Community Clam Bar, drinks at Parachute Bar, a rooftop wine bar called Boardwalk & Vine, and Test Kitchen, the collection's most upscale restaurant. Kitchen 21, 3052 W. 21st St., Brooklyn, NY 11224, 718-954-9801. As the name implies, Tramonti Pizza makes pizza inspired by the town of Tramonti, near the Amalfi Coast in southern Italy. Chef and owner Giovanni Vittorio Tagliafierro makes a pizza called "Veracious" with Re Fiascone tomatoes from Tramonti, DOP buffalo mozzarella and basil --- plus salads, antipasti, and focaccia with nutella for dessert. Tramonti Pizza, 130 St. Marks Place, New York, NY 10009, 212-260-1441. Rahi (meaning "traveler" in Hindi) serves modern, creative Indian food from chef Chintan Pandya. Expect dishes like crab in squid ink and coconut milk, and lobster tail with ramps. Dinner nightly. Rahi, 60 Greenwich Ave., New York, NY 10011, 212-373 8900. The former Campbell Apartment, located in Grand Central Terminal, is now simply The Campbell. It features original, swanky details from the space that was once the business tycoon/railroad exec John Campbell’s office. The Campbell serves classic cocktails, craft beers, and small plates. The Campbell, Grand Central Terminal, 15 Vanderbilt Ave., New York, NY 10017, 212-297-1781. Tipsy Scoop makes liquor-infused ice cream, which is sold in scoops, sandwiches and cakes at its Kips Bay shop. Seasonal and "classic" flavors include maple bacon bourbon and cake batter vodka martini. Tipsy Scoop, 217 E. 26 St., New York, NY 10010, 917-388-2862. Junzi Kitchen is a fast-casual eatery in Morningside Heights. On the menu are white or whole-wheat rolled chun bing pancakes and noodles paired with Chinese vegetables, braised meats, pickles and garnishes. Lunch & Dinner daily. Junzi Kitchen, 2896 Broadway, New York, NY 10025, 917-261-2497. Located in The Lowell New York, Jacques serves classic cocktails and bites like chickpea and eggplant croquettes, blini with caviar, and a burger with fries. Leather and velvet contribute to the décor of this Upper East Side bar. Open daily 5 p.m.-midnight. Jacques, The Lowell New York, 28 E. 63rd St., New York, NY 10065, 212-935-2888. Chef Tomer Blechman (Lupa, Maialino) helms the kitchen at Miss Ada in Brooklyn. Inspired by the Middle East, the menu features dishes like mussels with harissa, and swordfish with sumac, spring onions and asparagus. The backyard seats 30 diners and sports a colorful mural. Dinner nightly. Miss Ada, 184 Dekalb Ave., Brooklyn, NY 11205, 917-909-1023. The Financial District outpost of Hole in the Wall serves brunch (Greek yogurt panna cotta, coconut quinoa porridge) every day until 4 p.m., followed by small plates of cheese and charcuterie, plus coffee and cocktails. Brunch & Dinner daily. Hole in the Wall, 15 Cliff St., New York, NY 10038, 212-602-9991. Owner Paolo Alavian’s second outpost of Altesi features chef Paolo Nozzole’s wood-fired thin-crust pizzas, antipasti, pasta and mains like Mediterranean sea bass with leeks, shiitake mushrooms and blood orange. This Spring Street restaurant offers plenty of outdoor seating, too. Lunch & Dinner daily. Altesi Downtown, 200 Spring St., New York, NY 10012, 212-431-1212. Chef David Bouhadana (Sushi on Jones) will launch a new counter called Sushi by Bou, an omakase sushi spot in the Gansevoort Market. Also on offer will be sushi to-go. Check for the occasional collaboration with guest chefs. Sushi by Bou, Gansevoort Market, 353 W. 14th St., New York, NY 10014, 917-870-1587. Major Food Group’s The Grill has opened in the Midtown East space that was long home to The Four Seasons Restaurant. Sip a martini or a Champagne cocktail while you peruse a menu that highlights dishes prepared via the eponymous signature method: grilling. Look for honey mustard duckling, minted black bass and a classic porterhouse. 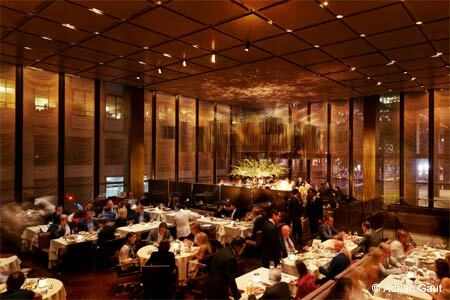 The Grill, The Seagram Building, 99 E. 52nd St., New York, NY 10022, 212-375-9003. Portland-based ice cream favorite Salt & Straw is teaming up with Danny meyer's Daily Provisions to offer flavors like rye bread with strawberry jam and poppy seed cheesecake. Salt & Straw, 103 E. 19th St., New York, NY 10003, 212-488-1505. When the lease ends on Keith McNally's Lower East Side Schiller's Liquor Bar in August, the restaurant will close its doors. Schiller's Liquor Bar, 131 Rivington St., New York, NY 10002, 212-260-4555. After thirty years, the Upper West Side mainstay Isabella's has closed. Isabella's, 359 Columbus Ave., New York, NY 10024, no phone.